New York Times best selling author, Susan Squires, is here today to tell us about the characters in her Magic series and her latest release, Night Magic. At the moment I’m in the middle of the six book Magic Series about the big and boisterous Tremaine family who are descended from Merlin of Camelot. The live in at the beach in a contemporary L.A. Merlin’s magic, dispersed through the ages, lurks in their DNA. Now, when each sibling meets another with the Merlin gene, the magic creates immediate attraction, true love, and a unique magic power emerges. Of course, they aren’t the only ones with magic. Members of the Clan are descended from Morgan Le Fay, and they have very different ideas about what to do with magic powers. 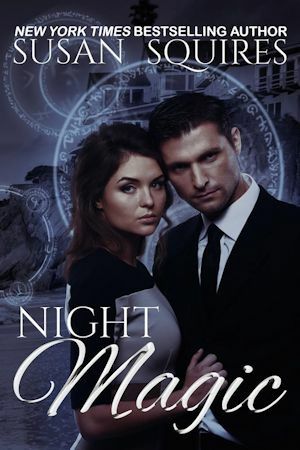 Night Magic, the fifth title in the series is the latest, newly available at the usual digital sources, and at Amazon in print form. I’ve grown to love the Tremaine family over the course of writing these books. Father, mother, six siblings and one adopted brother, various friends, new husbands and wives as the characters find their destined lovers—they’ve come to be a whole, unique world for me. The series takes place sequentially, and therefore all the family and some other key characters have been in every book, from the start of the series. I feel like I’ve watched the youngest ones grow up, and I’ve suffered with each character’s problems and trials right along with them, some of them continuing over multiple books. These people aren’t perfect. They struggle with their relationships just like real families. The parents don’t always do the right thing. The brothers don’t always agree. But there is an underlying love and loyalty there that my heroes and heroines can depend on. In some ways, the family is a character of its own. This is the first series I’ve done where the whole story arc had to be planned out before I ever sat down at the computer. It’s also why I recommend, for the very first time, reading the books in order, beginning with Do You Believe in Magic? I can already see a time when the series will be finished, even though I have two books left to write. I don’t know how I’ll let the family go. So I was rather relieved when a new character showed up in my mind about a month ago. He’s a very bad boy. And he wants his own book. So the series might be seven books long. Available from AMAZON KINDLE US, AMAZON KINDLE CA, AMAZON KINDLE UK, AMAZON PAPERBACK, BARNES & NOBLES NOOK, SMASHWORDS and ITUNES. Add to your TBR shelf at GOODREADS. Kemble strode around the car without a word, got behind the wheel and slammed the door. His lips were a thin, determined line. Then he seemed to see her for the first time. “Jane, that…that cheek looks really painful.” His face contorted with an angry look. “I should have been over here first thing this morning.” He was angry with himself, of course. “I could have gone to the doctor if I needed to, you know,” she said. What did he mean by that? The motor purred to life and Kemble put his arm over the back of her seat to turn and look out the rear window as he backed out. His fingers brushed her shoulder. She closed her eyes as the sensation shot up her spine. Did he have to be so careless? “Yes, I am.” He nodded his head convulsively. The man was sweating. “You want to loosen the tie or something?” He really looked like he was about to choke. “Uh. Okay.” Jane was getting a very bad feeling about this. It was going to be something about what he wanted to do with her mother. She just knew it. And she wouldn’t be able to accept his largesse, so he’d try to bully her into it. She started to protest, but he held up a hand. It was shaking a little. That stopped her far more effectively than anything he could have said. He wasn’t the kind of guy to tremble. Jane carefully shut her mouth, though that didn’t mean she could breathe. Kemble looked down at his hands, still on the steering wheel. “The family already loves you. And I’ll make sure your mother is taken care of. Enough money cures everything, Jane, and if it’s one thing I have, it’s money.” His eyes were so earnest it might break her heart. He’d given up. So he might as well marry her. Something heavy sat on her chest. She hardly trusted herself to speak. “Oh. Wait.” He lifted his hips to get his hand into the pocket of his slacks, and drew out a small square velveteen box. It said the name of the department store at the top of the hill on the bottom. He fumbled with it until he got it right side up and popped it open. A diamond ring gleamed in the rosy light of the setting sun. The setting was simple, just a band with three medium diamonds set in it. They glinted in the afternoon light. “I didn’t think you’d want one of those big diamonds that are always catching on everything. These… these are nice stones though.” He cleared his throat. It was actually just the kind of ring she would want the man she loved to give her. But not like this. She took a breath. “Kemble, you don’t want to marry me.” It took all the courage she had to speak those words. She couldn’t marry Kemble when he didn’t love her. That would be too selfish. The words were simple, spoken from his heart. He needed her. It was the one ploy that might get her to agree to this. She couldn’t bear how unhappy he’d been lately. Maybe this solution freed him from the razor-sharp pain of wondering if magic would ever happen for him, thinking he’d never be good enough. She wanted to believe that, because suddenly, she wanted to throw all sense and caution off the cliffs at the Breakers and accept him. Married to Kemble Tremaine, just as she’d dreamed since she was fourteen. A real member of the Tremaine family, with a right to make tira misu for their dinner or cut fresh flowers for the table. “Never going to happen.” He shrugged as though it didn’t matter to him. But in his blue eyes she saw that it did. He wasn’t over mourning his loss yet. He didn’t mean that, of course. He couldn’t give her the one thing she really wanted. And God, he was so close to her, he was overwhelming any sense she had at all. “Promise that if you ever do find the one really meant for you, you’ll tell me. I’ll set you free the next moment with no regrets.” Well, none she wouldn’t have anyway, whether she married him or not. She’d always regret he didn’t love her. His brows drew together sharply. He really hadn’t thought this out, had he? God help her. She nodded. New York Times Bestselling author Susan Squires published twenty-two novels and novellas with Dorchester Publishing and St. Martin’s Press, as well as self-publishing her new Magic Series. She’s won the Golden Heart and the Holt Medallion, been a finalist in the Rita contest and garnered several Reviewer’s Choice awards from Romantic Times BookReviews. Publisher’s Weekly named Body Electric one of the most influential mass-market books and One with the Shadows a Best Book of Year. She lives at the beach in Southern California with her husband, who is also a writer, and two Belgian Sheepdogs who help her by laying their chins on the keyboardddddddd. A big thank you to Susan for donating an autographed copy of her book, Do You Believe in Magic, to my Halloween basket giveaway. As you can see below, the contest is over and I will be choosing a winner. Thanks to everyone who blogged with me this month and to everyone who entered the drawing. Have a safe and Happy Halloween, and stick around for this weekend’s Howloween Blog Hop! More prizes including a chance to win a $50 Amazon gift card.